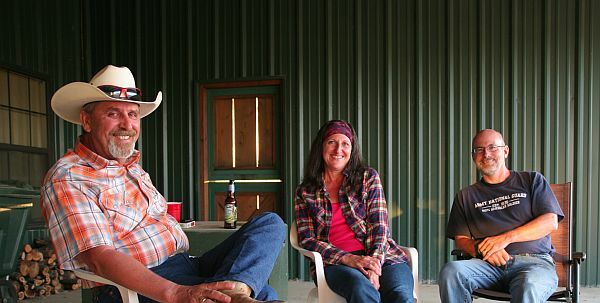 There will always be a special place in our hearts for Crockett Ranch. I suppose it is because our first visit there was a special one with Thanksgiving and all being together. It also is special to us because we spent two weeks there while the horrible cold spell hit North Texas (and the rest of the country). Russ had graciously allowed us to stay in the beautiful guest house. It was such a tremendous blessing! I am sure we would have frozen to death had we stayed in the trailer. Returning was just as special! We arrived at the most inopportune time. The road crews were widening the shoulder on the county highway that passes directly in front of the ranch. As we approached that area of the county road, it became apparent that they had just dug the trench to widen that part. We pulled up behind the pace car and told the construction worker, we needed to get in there. The crew chief had us pull off to the side of the road and wait until they had rebuilt that section. It wasn’t a long delay but it struck us as funny. It had taken us almost 6 months to get back here and when we arrive we can’t get in the driveway! It was only 20 minutes or so and we were able to drive over the section and get into the Ranch. Russ had come out and welcomed us while we were waiting, leaving everything ready for us, as always. We pulled into our ‘camping spot’ by the office/arena and set up. It was a lovely day in North Texas, breezy, warm and clear. Just stepping foot onto the Earth there is healing. Russ makes sure that you understand the underlying principle of the Ranch. Check your troubles and the World at the gate, then come in and have fun. He makes sure you do! I left Matt to finish up settling our home and made a grocery run to town. By the time I got back, Russ and Matt had gotten reacquainted and Russ was off again. He stopped by later to welcome me and make sure we had everything we needed. It rained hard all night, welcome waves of storms coming across North Texas. Rain is needed so desperately that even with the threat of bad weather accompanying the rain, it is welcome and appreciated. Many communities are rationing water already and one community is down to only 25% of its normal water supply for this time of year. The dry season has not begun! The drenching turned everything SO green! We have not seen a lot of rain in the places we have lived in the recent years so I took the opportunity to walk in the rain. It poured at different points but I loved it! The Ranch is rolling graze land with mesquite trees, cottonwood and oak. There are higher points close by and so there is diversity to the land. Very easy on the eyes. When I returned, Russ came by to let me know it was too wet to accomplish what he needed but he had a horse who needed some saddle time, if I was interested. Of course I was! I ended up riding for about 1.5 hours, all the while getting an opportunity to hear some of Russ’ stories. He also gave me a horse/riding lesson. For Russ, riding is almost as much about horse psychology as anything else. I did learn horses that way so his wisdom and skill are so welcome! I love the West Texas Cowboy stories but we talk about politics and life before “cowboyhood” as well. Toward the end of my ride Russ asked me to stop, Poochie and stay still until he told me I could move. I wondered what in the world he had cooked up now. He does have surprises sometimes. Well, this was a preventive surprise. When he said I could move and I turned, he had a writhing 4 foot rattlesnake by the neck. Boy, were his fangs long! It had started across the arena just after Poochie and I had passed the middle. Russ was on the fence rail and saw the movement. He saved the day for sure! He offered me the rattles but I passed. I have one set of rattles from Abby’s snake adventure, that’s enough. Yuck. Thanks Russ! Somehow we convinced Russ to join us for dinner that evening. It was a really great time of fellowship, sharing of dreams, family stories, laughter, and good food. Thanks for taking us up on the invitation Russ! It gave us an opportunity to give back ALL that you give us and many others. You are so appreciated!